This is a step-by-step guide for launching your own blog. I walk you through the process, including screenshots and videos, as well as different options depending on your budget. If you just want to get started with a one-click installation through Bluehost (recommended) click here. Let’s face it: There’s a lot of resources out there on blogging and building an online platform. Too many, in fact. But few of them take the time to break down each step into human terms that are easily understood by your average online user. That’s what this is — a simple but thorough step-by-step solution to help you launch your own blog, wherever you’re at in the process. So if you’re excited to get started — and get the help you need in non-robot terms — read on. First things first: Why blog? Do you actually need a website or place where people can find you online? Maybe not. I’m not one of those people who thinks everyone needs a blog. This can be a lot of work, and if you’re not up for it, don’t bother. But if you have something to say, a message the world needs to hear, then a blog is a great way to share it. When it comes to what blogging tools to use, I’m a fan of WordPress. It’s the best option out there. So everything I’m about to tell you is based on launching a WordPress blog. There are, of course, other options, but we won’t be talking about them here (feel free to Google “content management systems” if you don’t think WordPress is right for you). If you’re more of a visual person, the above video tutorial may be all you need to get started blogging. Feel free to skip the next 1500 words of instructions and click the “play” button above to see EXACTLY how to get started with a blog. It’s less than eight minutes long. Need more info, or want to see each step broken down? Your blog needs a place to “live.” You have a few options, ranging from free to moderately expensive (depending on your definition, of course). I want this to work for you, so I’ll share them below. Self-hosted: This means you own your blog and all of its content. You pay someone else to “host” it for you, but you can take your content wherever you want, whenever. It’s basically the online equivalent to owning a home — with all the work and worry included. The bottom line: The more money you spend on a blog, the more control you’ll have. And the less money you spend, the less control you’ll have (for the most part). 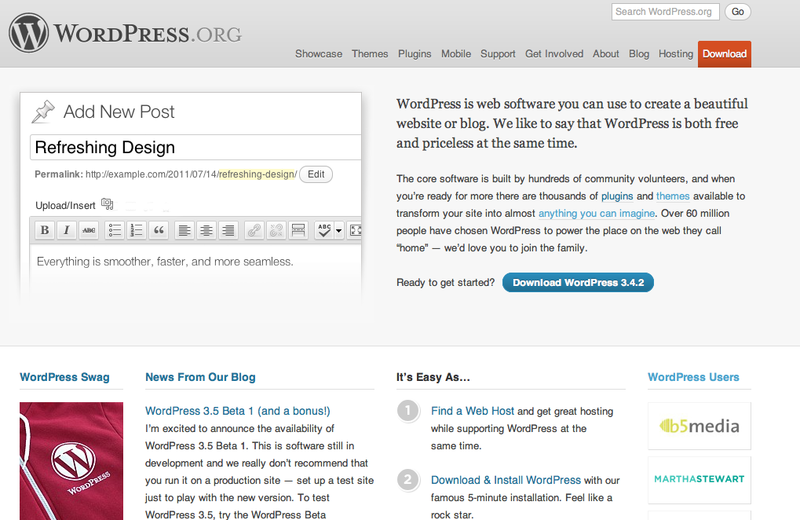 DIY: Set it up yourself by downloading the blogging software at WordPress.org and hosting it on a site like Bluehost.com. This will cost you $3.49/month (an exclusive deal for my readers). You’ll also need a theme. These range from free to a few hundred bucks. We’ll talk about that in Step 3. On-the-cheap: Sign up for a free blog at WordPress.com. If technology overwhelms you and you’re not ready to invest any money into your blog, I recommend going this route. You can always upgrade later. There are advantages and disadvantages to each option. The important part is find what works for you. But you need to decide which route to take before you begin blogging. Setting up a domain name on Bluehost is easy. A domain is where people find you. It’s where you “live” on the Internet. 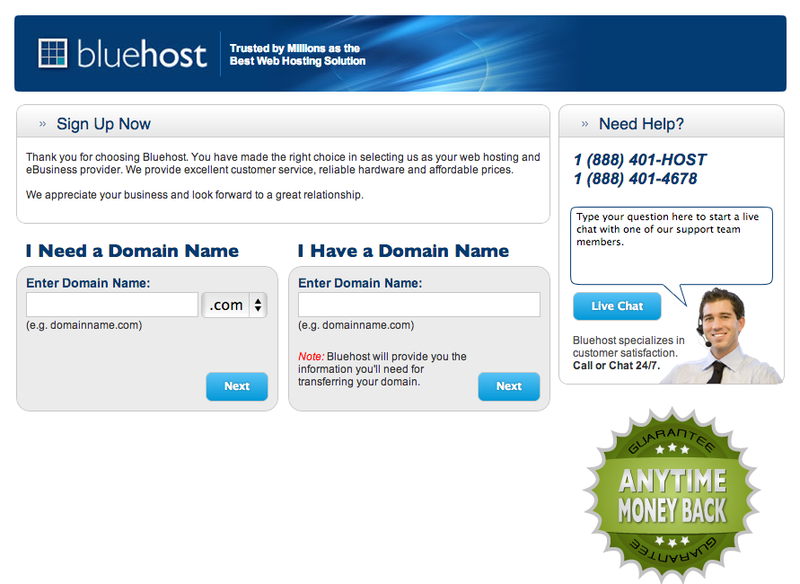 If you sign up for a hosting account at Bluehost, you can register for a free domain (recommended). What I don’t recommend doing is buying a domain name on one site (like Godaddy.com, for example) and then hosting it elsewhere. That can be complicated and messy (if you’re not tech savvy, this can stop you dead in your tracks). However, if you’ve already done that, don’t worry — scroll down to the bottom of this page and see how to transfer a domain. Once you acquire a domain name, you’re ready to move on. Don’t use hyphens (e.g. “goins-writer.com”). If the domain you want isn’t available without a hyphen, keep searching. Hyphenated URLs are confusing and hard to remember. Keep it short (ideally two words or fewer). Don’t make it a long phrase that is hard to remember. Don’t use numerals (you don’t want to have to explain that you mean “4”, not “four” when telling somebody your website address). Keep it clever-free. In other words, don’t use words that have double meanings or can be spelled multiple ways. Your domain should be intuitive and easy to understand. Don’t use words that are hard to spell. This includes your name. If you have a difficult-to-spell name, use a shortened version of your name or your middle name. Make it search-friendly. For example, DailyBlogTips.com is a blog that gets a LOT of traffic from people searching for — you guessed it — “daily blog tips.” If you’re going to focus on a topic, make sure that keyword or phrase is in your domain name. This is an important step and essential to your blog’s “brand.” Take some time to think through what you want your blog to be about and do it right. Once you buy your domain, you’ll need to point the name servers to your host. This is why it helps to have your host and domain with the same server — a service like Bluehost does all this for you. No fuss, no muss. WordPress is the best blogging software around. Once you have your host setup and a domain name, you’ll need to install WordPress, the blogging software most pro bloggers use, which you can download at WordPress.org. If you go with Bluehost, they provide helpful tutorials to walk you through this. Once WordPress is installed, you’re ready to start blogging. But before you do that, I recommend putting a nice “skin” on your blog. 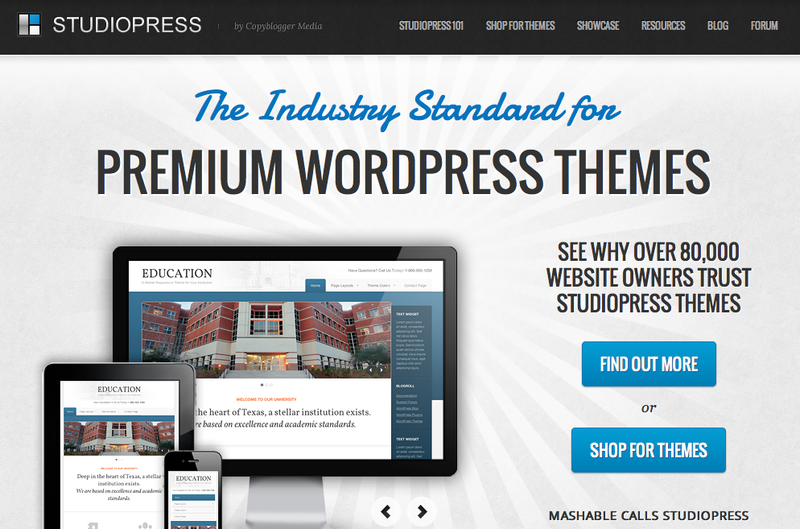 Studiopress is a great resource for blog themes. WordPress is just the “back end” for your blog. It’s like the main architecture of a house. Now, you need to paint the walls. How you do that is with a theme. Custom design: You can pay a developer to design a blog for you that looks like nothing else out there. If you have a budget of at least $500 and want something super professional, this is a good route to go. Premium theme: You can use a service like StudioPress or Tribe Theme to get a beautiful-looking theme for a fraction of the price it would cost you to pay a designer. Free options: You can search over 1000 free themes on WordPress and find one that works for you. Some of these you can customize, and some you can’t. If you don’t have a budget, this isn’t a bad place to start. 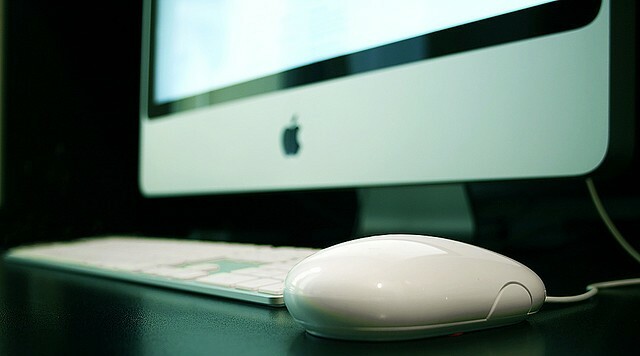 Once you’ve got your blog hosted and set up with a great design, it’s time to start posting. 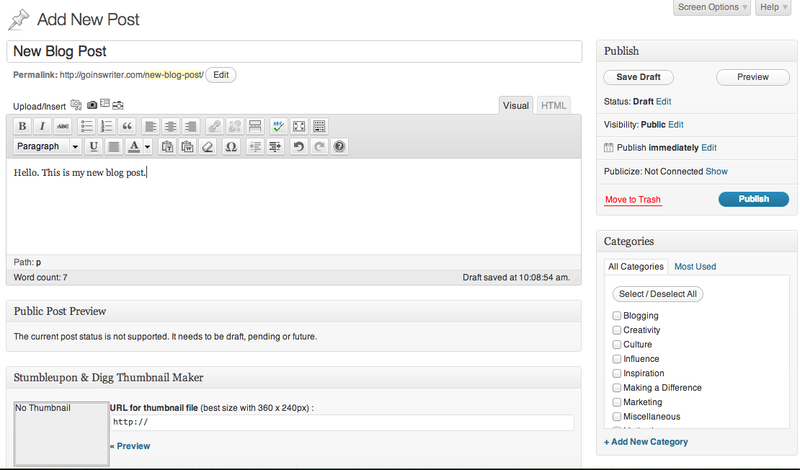 Writing a blog post on WordPress is easy and fun. Build an awesome “About” page. 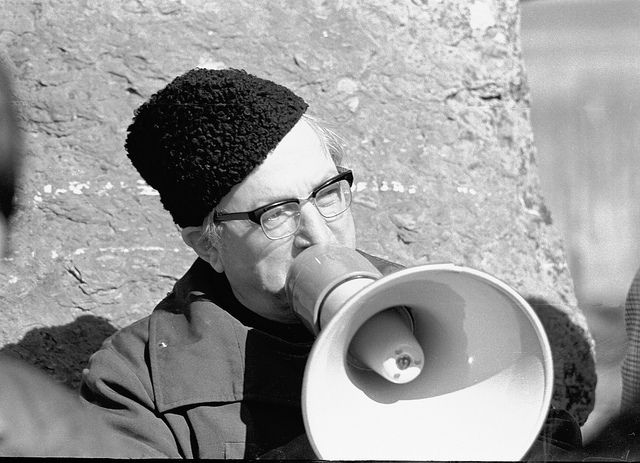 It should welcome people, tell your story, and explain why this blog exists. Create a way for people to subscribe. I recommend a good email newsletter like Mailchimp, which is free up to 2000 subscribers. Make sure this is an obvious place (my theme has this built in). Write your first post. Don’t fret too much about this (especially at first). Your first doesn’t have to be perfect; it just has to be published. Get into the habit of regularly creating content, and your writing will improve. Publish. This is the most important part of blogging: putting your work out there. None of this matters if you aren’t brave enough to share your work. So what’re you waiting for? Get started blogging! Change the name servers on your domain to point to your new host (and continue paying to host your domain elsewhere). Ready to begin blogging? Click here to get your blog set up on Bluehost. Disclosure: Some of the above links are affiliate links, which means that if you click them and buy something I make a commission — at no extra cost to you. This is just one way I’m able to support myself and keep this blog going. So if you enjoy the blog and were going to buy this stuff anyway, this is a great way to show your support. And don’t forget: I only recommend products and services that I use and love.